Dibenzothiophene (DBT) is an organic sulfur compound which remains in oil after hydrodesulfurization (HDS) process and can be removed by biodesulfurization (BDS). A new strain of Paenibacillus validus (strain PD2) was isolated from oil contaminated soils that able to desulfurize DBT. HPLC analysis and Gibb’s assay showed that this strain was capable to convert DBT to 2-Hydroxybiphenyl (2-HBP) as final product. The presence of dszC gene confirmed that DBT desulfurization occurred through the 4S pathway. Maximum growth and the highest induction in dsz operon obtained in the presence of dimethyl sulfoxide (DMSO) as sole sulfur source. DBT concentration, temperature and pH were optimized statistically for growing and resting cells by using Response Surface Methodology (RSM). All parameters in growing cells had a significant effect on 2-HBP production during BDS of DBT by P. validus PD2, although in resting cells temperature in range of 20-40 ˚C was not a significant factor. Maximum BDS for growing cells was obtained at 0.41 mM DBT concentration, pH 6.92 and temperature 31.23 ˚C. For resting cells, optimum pH, temperature and DBT concentration were 6.62, 27.73 ˚C and 7.86 mM respectively. The results of this study showed that high concentrations of DBT could be desulfurized by P. validus strain PD2 in model-oil. Thus, the isolated strain could be introduced as a proper candidate for biodesulfurization of organic sulfur in the oil industry. Sulfur is the third most common element in the crude oil composition after carbon and hydrogen which causes severe environmental pollutions. For example, burning the petroleum based fuels containing sulfur components will release SOx gases to the atmosphere leading to acid rain and corrosion problems. Consequently, deep desulfurization of the crude oil is compulsory to prevent the production of such pollutants (Derikvand et al., 2014). Hydrodesulfurization (HDS) process which has been usually employed in oil refineries, works at high temperatures and pressures (more than 300 oC and 100 atm) (Ma et al., 2002) and is effective in removing a large amount of inorganic and a part of organic sulfur from the crude oil. However, the major part of organic sulfur content is resistant to HDS and remains in the oil composition after this treatment (Borgne and Quintero, 2003). As a remedy, biodesulfurization (BDS) process has been suggested to remove the recalcitrant organic sulfur compounds like dibenzothiophene (DBT) which is often used as a model of heterocyclic sulfuric compounds in biodesulfurization studies. In fact, BDS has several advantages which make it a potentially alternative or at least a complementary process to the HDS. For instance, BDS is more specific and cost effective and takes place at ambient temperature and pressure (Monticello, 2000). In addition, the combustion value of the oil would not be affected in the BDS process because the effective bacterial strains (such as Rhodococcus and Gordonia) can remove the sulfur through the 4S pathway, which attacks the C-S bounds selectively (Gou et al., 2002). BDS through 4S pathway has been studied using different bacterial species such as Gordonia (Rhee et al., 1998), Bacillus (Kirimura et al., 2001), Lysinibacillus (Bahuguna et al., 2011) and Rhodococcus (Derikvand et al., 2014). Generally, there are four enzymes involved in the 4S pathway: first, DBT monooxygenase (DszC) oxidizes DBT to DBT-sulfone (DBTO2). In the second step, flavomonooxygenase (DszA) catalyzes transformation of DBTO2 to 2-2′-hydroxyphenyl benzene sulfinate (HPBS) and in the final step, HPBS is desulfinated by DszB to produce 2-hydroxybiphenyl (2-HBP) as the final product (Yan et al., 2000). Three catabolic genes, dszA, B, C, are clustered in the dsz operon. The fourth enzyme (DszD) prepares FMNH2 required for oxygenase reactions and is a chromosomal gene (Derikvand et al., 2013). Clearly, performance and activity of the enzymes in the 4S pathway is dependent on their operating conditions and a high BDS efficiency could be achieved in the optimum level of the effective parameters. Although BDS process has been studied for physiology of microorganisms and their gene modifications, metabolic pathways and kinetics of desulfurization in both model and diesel oils, the significance of operational factors and their optimization through statistical methods are rare. Response Surface Methodology (RSM) is one of the well known statistical methods which is utilized to find a relationship between a few effective variables and one or more responses in a system. In this approach, analysis of variance (ANOVA) and regression techniques have been employed to estimate a low degree polynomial model for optimization of the levels of significant explanatory variables in a limited number of experiments (Khurana et al., 2007). In the present study, Paenibacillus validus PD2 which was isolated from an oil contaminated soil sample was employed to investigate the effects of important operational conditions such as initial DBT concentration, temperature and pH on the BDS efficiency. Box-Behnken RSM was used to determine the optimum value of these factors in BDS process for both growing and resting cells conditions in aqueous and biphasic (aqueous / model-oil) systems, respectively. Finally, the BDS efficiency was determined in the obtained optimum conditions. Chemicals. All chemicals were analytical grade and commercially available. Enrichment, isolation and identification of DBT desulfurizing bacteria. Double deionized water was used to prepare sulfur free basal salt medium (BSM). The BSM contains the following composition (g/l): Na2HPO47H2O 8.0, KH2PO4 4.0, NH4Cl 2.0, MgCl2 0.2, FeCl3 0.001 and CaCl2 0.001. More than 100 oil contaminated soil samples were collected from various areas in Iran. One gram of each soil sample was suspended in 50 ml of BSM supplemented with 10 g/l glucose and 0.3 mM DBT as the sulfur source in a 250 ml flask. After incubation for 3 days at 30 ˚C and 180 rpm on a rotary shaker, 5 ml of supernatant was inoculated in 45 ml of fresh BSM supplemented with 0.3 mM DBT and 10 g/l glucose. Subculturing was repeated with 1% v/v inoculums five times. Afterwards, streak culture was done onto the same medium with 9 g/l agarose. Finally, a single colony was isolated and its 2-HBP production was detected by Gibb’s assay. One of the Gibb’s positive isolated strains named PD2, was genetically identified by partial 16S rDNA gene sequencing using DG74 and RW01general primers. Detection of dszC gene from dsz operon. Briefly, chromosomal DNA of P. validus was extracted (by DNA extraction kit, Fermentas) and separated on 1% agarose gel with 1X TAE buﬀer (Promega, Germany) at 80 V for 40 min. The extracted chromosomal DNA was amplified by PCR with applying specific dszC primers as forward 5′-GACACTGTCACCTGAAA-3′ and reverse 5′-CTCAGGAGGTGAAGCCG -3′ primers. The amplified gene separated on 1% agarose gel with 1X TAE buffer (promega,Germany) at 80 V for 40 min. The amplified gene was purified using gel extraction kit (Promega Germany). The quantity and quality of the purified gene was assessed by optical density at 260 nm and 280 nm and by electrophoresis in 1% agarose gel (Promega, Madison, WI, USA). The correct orientation and nucleotide sequence of the gene was verified by double-strand sequencing. Characterization of growth and biodesulfurization. Growth rate, DBT consumption and 2-HBP production by isolated P. validus PD2 were measured by turbidimetry (600nm), UV spectrophotometry (323.8 nm) and Gibb’s assay (610nm wavelength) respectively for 4 days incubation period. The culture media was BSM supplemented with 0.3 mM DBT and 15 g/l glucose incubated at 30 ˚C on a rotary shaker. Biodesulfurization in the liquid media by growing cells. 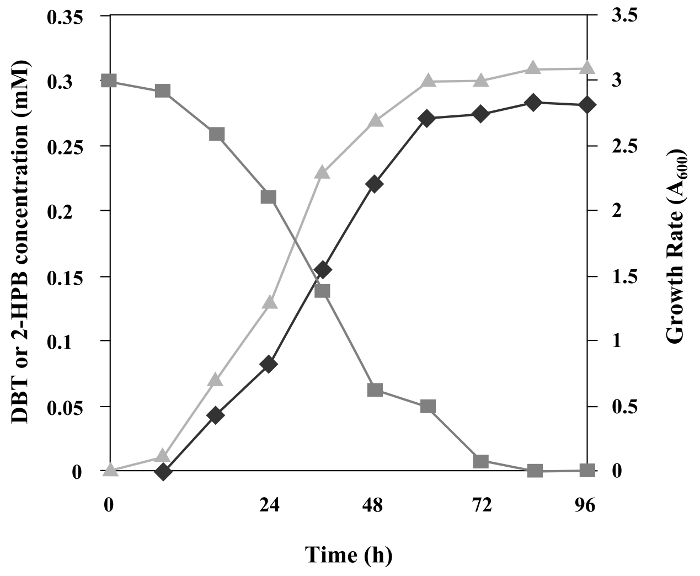 For growing cells, the strain was inoculated in BSM supplemented with different amounts of DBT and 10 g/l glucose and 2-HBP production was measured after 48 h incubation time. Biodesulfurization in the biphasic media by resting cells. The biphasic media consist of BSM (aqueous phase), n-tetradecane (organic phase) and different amount of DBT as a sulfur source, were prepared to monitor the BDS activity by the resting cells. The ratio of aqueous to oil phase volume was 2:1. 2-HBP production was determined after 20 h.
Effect of different sulfur sources on growth and BDS rate. Several sulfur sources such as DBT, thiophene, dimethyl sulfoxide (DMSO) and MgSO4 were added to 50 ml BSM in concentrations equal to 0.3 mM, 1 µl/ml, 200 mg/l and 200 mg/l respectively. The carbon source was 10 g/l glucose. 0.5 ml of cell suspension with OD600 = 1 was inoculated to each medium and growth rate and 2-HBP production were determined after 30 h.
Experimental design for biodesulfurization by growing and resting cells. DBT concentration (X1), temperature (X2) and pH (X3) were considered as the important factors in biodesulfurization activity of growing and resting cells. A 3-factor and 3-level Box–Behnken design (BBD) was used to determine the optimum level of the important factors and to study their relationship to the BDS efficiency. Factors and their levels are shown in Table I. For resting cells design, we increased the range between high and low levels of factors (Table I) to better illustrate the impact of variables. All factors at middle (0) level constitute the central points while combination of factors consisting of one at its lowest level (-1) or highest level (+1). A 0.05 significance level was assumed to perform ANOVA for the model coefficients. A total of 15 experimental runs of three factors in different combinations were carried out in duplicates (Table II). All experimental design and data analysis were performed using Design Expert software package version 8.0.1. Analytical methods. Cell density was measured by spectrophotometry at 600 nm (OD600) (spectronic21D Milton Roy). In the growing cells system, BDS activity was monitored using the Gibb’s reagent (2,6-dichloroquinone-4-chloroimide). To measure the DBT consumption in the growing cells samples, their pH was reduced to 2 before mixing with equal volume of ethyl acetate. After centrifuging at 3000 rpm for 5 min., dissolved DBT in the organic phase was measured by UV spectrophotometry at 328 nm. In the resting cells system, HPLC was used to determine the amounts of DBT (retention time = 5.29 min.) and 2-HBP (retention time = 3.16 min.) in n-tetradecane phase. HPLC was performed on a KNAUER advanced scientific instruments (Germany) equipped with an MZ-analysentechnic C18 column (5 µ-250 mm) and a UV detector (Smartline 2600) set at 254 nm. The mobile phase was methanol–water (90:10, v/v) with a flow rate of 1.5 ml/min. For all of the analytical methods standard curves of DBT and 2-HBP were prepared. Identification of the strain PD2. The numerous bacterial colonies isolated from diesel contaminated soils were checked for 2-HBP production from DBT as sole sulfur source. The Gibb’s analysis showed that a strain designated as PD2 was able to produce 2-HBP as a final product. Since 2-HBP production indicates selective cleavage of carbon-sulfur bond, further characterization and optimization was performed on this strain. Gram and acid-fast staining, colony morphology and biochemical activities revealed the PD2 strain as Gram- positive, spore- forming and non-acid fast bacillus. Partial nucleotide sequence analysis of 16S rRNA gene implied 99% homology with P. validus SB3263 (NCBI Gene Bank Accession No. GU191921). Therefore, PD2 was identified as a novel strain P. validus PD2 and deposited in NCBI (NCBI Gene Bank Accession No. KC161368). By now, several aerobic DBT-desulfurizing bacteria have been reported to date that are able to desulfurize DBT via 4S pathway. In particular, Rhodococcus erythropolis IGTS8, the first strain found able to desulfurize DBT through 4S pathway, has been widely used for BDS and the genes related to this pathway have been studied (Denome et al., 1993). However, according to our knowledge, no studies have ever been reported using P. validus cells for DBT biodesulfurization via 4S pathway. Therefore, strain PD2 is the first P. validus strain reported to be capable of DBT desulfurization, without carbon skeleton cleavage. Characterization of growth and biodesulfurization. The growth curve of P. validus PD2 has been shown in Fig. 1. The growth was continued for 96 h, simultaneously with the consumption of DBT and the production of 2-HBP. As shown in Fig. 1, desulfurization of DBT to 2-HBP in the induced cells of PD2 was detected after 8 hours, afterwards, the concentration of 2-HBP in the medium increased up to 0.27 mM at 50 hours (initiation of stationary phase). The production of 2-HBP is less than DBT consumption which as previously suggested by Caro et al. (Caro et al., 2007), this is due to accumulation of 2-HBP and other 4S pathway compounds inside and on the surface of the cells. Detection of dszC gene in P. validus PD2. The 1300 bp PCR product of amplified dszC gene by specific primers (Fig. 2) purified from the gel and sequenced by double-strand sequencing. The length of sequenced fragment was 1153 bp. Sequenced DNA was blasted in NCBI GenBank. The blast result showed that dszC in P. validus PD2 had 98% similarity with dszC gene in R. erythropolis FMF. This sequence was submitted in NCBI by accession number KF056797. The presence of dszC gene confirmed that DBT desulfurization takes place through the 4S pathway which produced 2-HBP as final product without cleavage of carbon ring; therefore, the strain PD2 could be used for BDS of oil without decrease in octane rate. Effect of different sulfur sources on growth and biodesulfurization rate. P. validus PD2 was cultured in the presence of different sulfur compounds. As shown in Table III, a higher cell density was obtained when DMSO was used as the sole sulfur source, because of more easily metabolization of DMSO than others sulfur sources (Bustos-Jaimes et al., 2003). Growth rate of isolated strain PD2 in the presence of different sulfur sources and 2-HBP production from DBT after cultivating of induced cells in 0.3 mM DBT. Moreover, the growth rate can be inhibited by production of 2-HBP when DBT is used as the sulfur source (Setti et al., 2003). In fact, induction of dsz operon by DMSO in Rhodococcus sp. OneAWQ has been shown to be similar to DBT (Ma et al., 2006) while Mohebali et al. (2008) showed that 2-HBP production of resting cells grown on DMSO was higher than that of DBT. The results indicated that the cell density in the presence of MgSO4 was more than DBT and thiophene. This occurs due to the lower water solubility of DBT and thiophene. Although the dsz operon can be repressed by MgSO4 as a sole sulfur source during the growth (Li et al., 1996), PD2 grown on sulfate showed low BDS activity that could be explained by re-expression of dsz operon. Finally, the maximum BDS activity of the PD2 strain resting cells was achieved when they were grown on DMSO. where is the predicted response, is the variable, is constant, is the linear effect, is the quadratic effect, and is the interaction effect. Where Y is the response value (mM), X1 is the initial DBT concentration (mM), X2 is temperature (˚C) and X3 is pH. Positive and negative sign before each term indicates synergistic and antagonistic effects respectively (Tan et al., 2010). The ANOVA results for 2-HBP production by growing cells have been shown in Table IV. The Model F-value was 142.23 that imply its significance and there is only a 0.01% chance that a Model F-value this large could occur due to the noise factors. Also values of Prob > F (P value) less than 0.05 indicate model terms are significant. In this case, X1, X2, X3, X2X3, X12, X22 and X32 were significant model terms (P values < 0.05). The proposed model was proved to be adequate through calculation of its Lack of Fit equal to 0.49 and adjusted determination factor (Adj R2) equal to 0.9891. This means that the Lack of Fit is not significant relative to the pure error and the model predictions were well fitted the experimental results. According to the present model, all of the main factors were significant in the interval of variation and temperature has significant interactions with pH. Resting cells:The relationship between the 2-HBP production of resting cells and the studied variables after removing non significant parameters stated as equation 2. In equation 2, all of the coded variables are defined similar to equation 1 in the previous section. The ANOVA results for 2-HBP production by resting cells have been shown in Table IV. P-value of the model was obtained equal to < 0.0001, which warrantees the model significance. In this case, X1, X3, X1X2, X12 and X32 were significant model terms. The Lack of Fit value of 0.2 indicated the Lack of Fit was not significant relative to the pure error and the adjusted coefficient of determination (AdjR2 = 0.9881) confirmed the significance of the model. DBT initial concentration, pH and also the interactions between DBT concentration and temperature were significant in the BDS by resting cells (Table IV). RSM analysis. The response surface and its contour plots at the base can represent the regression model developed to investigate the interaction between factors and specify the optimum level of each factor. The interaction of two independent factors can be shown by each response surface with a contour plot, while another factor is fixed at the level of zero. The fitted surface and contour plots between DBT concentration and temperature, DBT concentration and pH, temperature and pH are presented in Fig. 3 and Fig. 4 for growing and resting cells systems, respectively. Fig. 3 The response surface and contour plot of 2-HBP production (mM) by growing cells of Paenibacillus validus PD2 in aquatic system. a: optimum concentration of DBT (mM), b: temperature (˚C) effect and c: effect of pH on 2-HBP production. Fig. 4 The response surface and contour plot of 2-HBP production (mM) by resting cells of Paenibacillus validus PD2 in biphasic system (tetradecane-water). a: optimum DBT concentration (mM), b: effect of temperature (˚C) and c: pH effect on 2-HBP production. Effects of DBT initial concentration: Results indicated that an increase in the initial DBT concentration would make DBT more available to the cells and led to an enhancement in BDS. However, at higher initial concentrations of DBT, bacterial growth and BDS activity would be inhibited, presumably because of the toxicity of DBT at high concentrations beyond the tolerating level of the bacteria (Ansari et al., 2007). Such inhibitory effect of DBT has been reported formerly (Ohshiro et al., 1995). It is known that only water soluble compounds can play an inhibitory role on the cell activity. DBT has an extremely low solubility in water and expected to precipitate in aqueous medium or fully dissolved in the organic phase of biphasic medium and thus, the initial concentration of DBT expected to have an insignificant effect on the cell or enzyme activity. However, most bacterial species with DBT biodesulfurization activity secrete some biosurfactants to solubilize and enhance the bioavailability of DBT (Kim et al., 2004). Also, recombinant Pseudomonas strains with high production of biosurfactant have been developed, which could enhance biodesulfurization activity (Gallado et al., 1997). Therefore, by secretion of biosurfactants inhibitory effect of DBT would not be limited. Fig. 3A shows that the optimum concentration of DBT in growing medium for PD2 strain was 0.41 mM and BDS activity was reduced by both the increasing initial DBT concentration up to 0.8 mM or decreasing it to 0.2 mM due to the limit in the growth rate. Also in biphasic medium and resting cells system, the optimum concentration was determined at 7.86 mM and as can be seen in Fig. 4A, the BDS activity was reduced by going away from the optimal point. For the resting cells, the optimum point for the initial DBT concentration was far more than the growing cells. In fact, in the biphasic medium, DBT can be dissolved in n-tetradecane (organic phase) which reduces its toxic effect on bacteria. Effects of temperature: Temperature is a potentially limiting factor like essential chemical elements and organic substrates. In particular, temperature should be studied as an interactive factor, because it affects all chemicals and biochemical processes (Ratkowsky et al., 1982). P. validus PD2 is a mesophilic bacteria and its optimum temperature for BDS of DBT in growing medium was determined at 31.23 ˚C. The surface and contour plot in Fig. 3B indicates that in high and low temperatures, 2-HBP production was low because of the limiting influence of temperature on the growth rate and enzyme activity. In resting cells, the optimum temperature for the 2-HBP production was 27.73 ˚C (Fig. 4B). Although the growth rate limiting effect was absent in resting cells, the activity of enzymes can be reduced at the higher or lower temperatures. It has been indicated that in biodesulfurization by Mycobacterium phlei WU-F1, degradation of DBT to DBTO2 stops at high temperatures while degradation of DBTO2 and other intermediate compounds maintain at this condition. It can be concluded that the activity of the first enzyme oxidizing DBT to DBTO2 is sensitive to temperature changes (Furuya et al., 2001). In fact, Furuya et al. suggested that the first and third enzymes in 4S pathway (DszC and DszB) are more sensitive to temperature changes in comparison with the other enzymes and are considered as the BDS rate-limiting enzymes. Effects of pH: The pH, like other factors in culture medium such as temperature and carbon source, is an effective parameter that controls the bacterial growth rate (Stahl Madigan et al., 2012). In addition, enzymes are affected by the pH variations in the system because of the dependence of the 3-D shape of enzymes on the pH. The impact of pH variation is not devoted to only the shape of enzymes. However, it may also affect the shape or electrical charge properties of the substrate in such a way that the substrate cannot bind to the enzyme active site or it cannot undergo catalysis (Berg et al., 2007). Previous studies showed that the highest DBT biodesulfurization by the bacterial strains was obtained at pH near to neutral (Kirimura et al., 2001; Etemadifar et al., 2008; Ardakani et al., 2010). Also, it has been indicated that the purified 4S pathway enzymes such as flavin reductase are active only at the pH 6-8 (Matsubara et al., 2001). Figure 3C and Fig. 4C shows the surface and contour plots of pH for 2-HBP production in growing and resting cells systems, respectively. The optimum pH in growing condition was 6.92 and as shown in Fig. 3C, by a change in pH, 2-HBP production was reduced. In resting cells BDS of model oil, the optimum pH was equal to 6.62 (Fig. 4C). In conclusion, this study demonstrated that the newly isolated strain P. validus PD2 can catalyze the conversion of DBT to 2-HBP in aqueous and biphasic systems via the 4S pathway. The response surface methodology showed that the optimum DBT concentration in aqueous and biphasic system was 0.41 and 7.86 mM respectively. Also in both media, the optimum temperature was mesophilic and the optimum pH was near the neutral. Therefore P. validus PD2 can be efficiently used for oil BDS under ordinary conditions and high activity can be obtained by setting the effective parameters at the optimum levels. We appreciate the financial support for this work from the University of Isfahan . Berg J.M., J. Tymoczko and L. Stryer. 2007. Biochemistry. Freeman and company, New York. Stahl Madigan M.T., J.M. Martinko, D.A. and D.P. Clark. 2012. Brock Biology of Microorganisms. Benjamin Cummings(eds. ), San Francisco.